If you want to attract a different bird species, don’t forget to visit that article for the birdhouse reference table. Purple Martins, along with American Martins, enjoy open nesting, although they can still be considered as secondary cavity nesters. Owls of all kinds prefer cavity nesting, as well as some types of wrens, like the House and Carolina Wren, and all bluebirds. On the North American continent, you will be able find 7 chickadee variants, but all of them are easily recognizable due to their distinctive dark cap cover with a white triangular patch stretching from the beak. Surprisingly for their tiny stature, chickadees have relatively long life-spans, between 10-12 years. Their moniker chick-a-dee is actually onomatopoeic, meaning that the name is closely associated with the sound their produce – dee. Like with all birds, they have a rudimentary language that facilitates cooperation and a warning system. In chickadee’s case, one dee would signal no threat, while five dees would signal a predator in the vicinity, like the Northern Pygmy Owl. Chickadees’ birdhouse should be at least 5 feet above the ground, all the way up to 15 feet at its highest. They cover about 9 – 10 acres and usually congregate near trees. Most of the chickadees do not engage in migrations, so you are likely to see them in winter. Additionally, they will require up to 10 times extra food compared to warmer season, so you can count chickadees as primary candidates for bird-housing, and birdbath heaters. But don’t worry about their food supplies, as they are famous for being industrious food hoarders. Shorter in life span than chickadees, but much louder considering their size, there are over 40 different wren species documented worldwide. However, House and Carolina wrens will be your most common ones in North America. Of all the small birds, wrens are most likely to be easily attracted to a birdhouse you mount. Only the House Wren is migratory, except for some exceptions in Southern California. The wren birdhouses should be mounted between 5 to 10 feet above ground. As native North American birds, bluebirds suffered heavy losses as new invasive bird species were introduced into their habitats, along with the systemic loss of their habitats as humans spread from coast to coast. However, in the last 50 years they have largely recovered thanks to organized efforts of many bird societies, which created a wide network of nesting boxes, specifically designed for bluebirds. Although bluebirds can be considered migratory, they only migrate short distances and only if they can’t find enough resources in their current area. The more extravagant and gaudy looking than other birds, Purple Martins are ideal to set up in multiple housing, apartment-style birdhouse due to the fact that they do not defend their territories. If you feel like improvising and provide some fantastical element to their housing, you can even set them up in gourds. Mounting height at least 15 feet, preferably near an easily accessible body of water. Owls vary in size greatly, so you will have to find which specific ones live in your geographical area. Although they are nocturnal hunters, be careful to not attract owls that pose greater danger to the smaller birds you want to attract. A quick Google search based on species should give you some owl house plans and dimensions. Screech Owls, Barred Owls, Barn Owls and Great Horned Owls seem to be some of the most popular. Some part of the birdhouse flooring should be reserved for drainage holes, or a grating. It is important to integrate this into your birdhouse so you can prevent the forming of mold and bacteria. The top side of the wall, just beneath the roofing should have ventilation holes, so the birdhouse doesn’t succumb to overheating. Additionally, wood is better for insulation and heat absorption than metal. Overhang the roof over the entrance hole in order to provide shelter from the bad weather, as well as shade during the hot summer months. Avoid perches, which could serve as ramps for predators. Holes with predator guards are always a preferable solution to birdhouse perches. Avoid using paints drenched in chemicals, buy ones that are completely non-toxic for living organisms. Also choose colors that are natural and earthy – green, brown, grey, beige, tan…but avoid colors that are too dark so they don’t absorb more sunlight than necessary. Plan for easy maintenance. How are you going to open a birdhouse, especially one that has multiple levels and rooms? 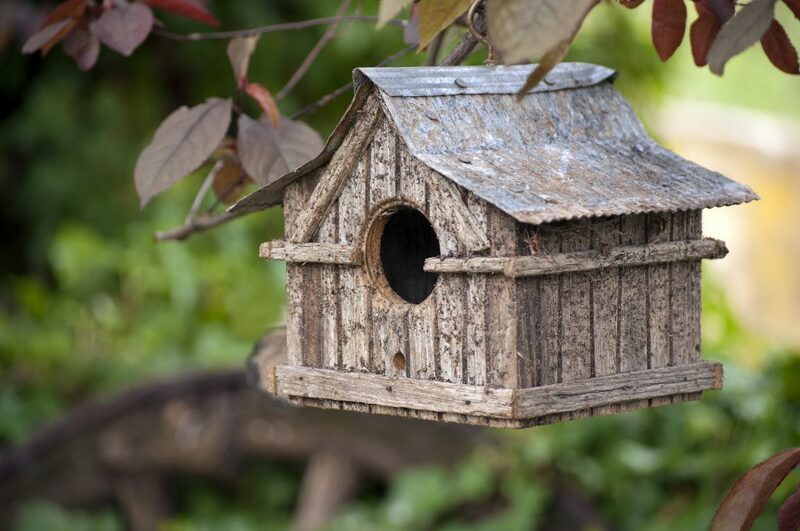 Build or choose birdhouses that can be slotted into a mount and have an easy opening mechanism.